Often it’s been said that no one cares quite like family. At Brookside we take those words to heart. When you pass through the doors of our family-owned community, you quickly see the difference family makes. And you feel right at home. Locally-owned and operated by the Mazzaferro family, Brookside’s goal is to help each and every resident we serve to maximize their opportunities to live life to the fullest. Our beautiful campus, nestled in a spacious, country setting, offers two distinct residences. Together the Brookside Independent Patio Homes and Brookside Personal Care Residence form a continuum of care that enables our residents to maintain their highest level of independence as they age in place. 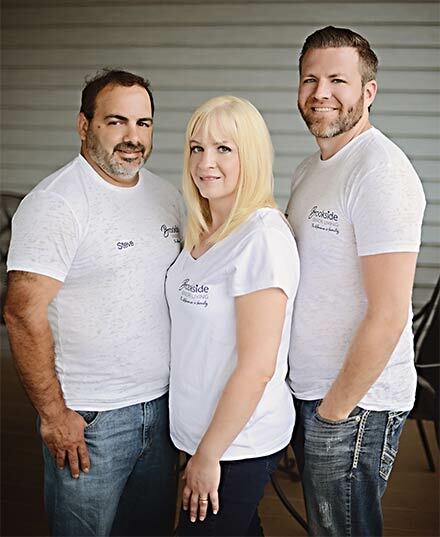 Brookside Senior Care was established in 1997 by Steve and Kristen Mazzaferro, who shared a vision of providing care for older adults in a homelike setting with a family atmosphere. Kristen’s brother, Tom Guthridge, joined Brookside in 2003 and brought his knowledge, skills and additional support to the team. Today, Brookside is still family owned and operated, which gives residents and their families peace of mind knowing that those ultimately responsible for their care are down the hall, not across the country. When Brookside Personal Care Residence initially opened in 1997, the 20-room residence was licensed as a personal care home by the Pennsylvania Department of Public Welfare. Since then, many additions, renovations and updates have enhanced our services and our campus, including the expansion of the residence to accommodate 50 residents and the addition of eight maintenance-free patio homes for seniors who desire to live independently. Fortunately, despite our modest growth, Brookside maintains its gracious family atmosphere, values and closeness. Kristen Mazzaferro is a graduate of DuBois Area High School and earned a Bachelor of Science degree in Nursing in 1992 from Indiana University of Pennsylvania. A licensed RN since 1992, Ms. Mazzaferro has extensive experience in behavioral health, home health, and geriatric nursing. She is a Certified Personal Care Home Administrator. Her husband, Steven Mazzaferro is a graduate of St. Mary’s Area High School and earned a Bachelor of Arts degree in Psychology in 1985 and a Master’s in Counseling in 1995, both from Indiana University of Pennsylvania. He has nearly two decades of experience in behavioral health in community and hospital settings. The Mazzaferros have owned and operated Brookside since 1997, with a tireless passion for serving older adults and helping them live life to the fullest. They live in Reynoldsville with their two children. Thomas Guthridge graduated from DuBois Area High School, then obtained his Bachelor of Science degree in Business Administration in 2001 from The Pennsylvania State University. The brother of Kristen Mazzaferro, he has been a devoted member of the Brookside team since 2003. Mr. Guthridge is a Certified Personal Care Home Administrator and a Certified Medication Administration Trainer with the Pennsylvania Department of Public Welfare. He resides in DuBois with his wife, Christy, and their two children. Jefferson Democrat Readers Choice, Award for 2013/2014 for favorite nursing home. We know you have a choice whether seeking a comfortable retirement destination for yourself or the perfect community to care for your loved one. What makes Brookside different from the other options is our smaller size and nearly two decades of local ownership by our caring family. Our owners provide direct hands-on care and management every day, and they stake their personal reputations on the quality of services provided. There is nothing “corporate” about Brookside. You’ll only find down-to-earth, hardworking people who always have your best interests at heart. We encourage you to visit and see for yourself. We’re pretty sure you’ll want to stay awhile!